now the lastest run of our regular GFS takes the LOW thru the straights..
Good afternoon and good luck on the rains. Nothing going on here. There's a fairly healthy band of showers or storms about 15-20 miles to my west but moving NNW. It has clouded over and there is a nice breeze so it feels quite pleasant outdoors. I can't complain. LOL Aug, that wasp nest never goes away! sangria wrote: LOL Aug, that wasp nest never goes away! well I got some nice rain showers last night,everything is wet outside...airport is reporting .034 rain..i might have gotten a little more than that here by me..whatever the amount, its nice to see the afternoon/evening rains return finally. Good Saturday Morning folks! !..blogs COFFEE is perking for when you get here..enjoy..have a wonderful day everyone! is everyone ok from those storms yesterday?..sure was ALOT of Lightning and thunder huh,glad I wasn't caught outdoors whew. Good morning. Feels very summer-like this morning. Warm with high dewpoints. Looks like one more day of dry weather for my area followed by good rain chances tomorrow through mid-week before a front moves through and dries things out. 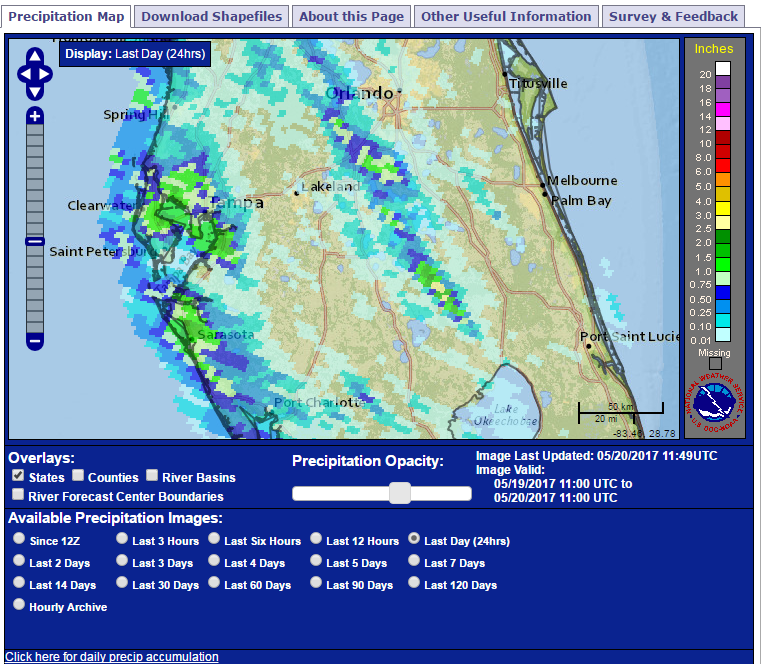 Been a LONG time since the entire state of FL has been painted with good precipitation amounts like this. Precip for the past 24 hours. Fairly large area of 1"+ in/around the Tampa Bay area. Snip from the JAX discussion. wind gusts and large hail, with 500 mb temps around -10C." You should take a gander at that cam for a few minutes in the afternoon Largo. It has about as much wasp traffic coming in/out as O'Hare airport in Chicago! I never realized wasps nested so high. The cam is well above the trees. Our sky tower webcam is mounted 70ft above the ground (88ft above sea level) on the broadband tower behind our building and shows an incredible view of the West Pasco skyline. The camera's wide angle view captures from due East of our location (approximately Starkey Park) to Southeast (approximately Longleaf and Trinity areas). You can view a detailed map showing the exact viewing area of the camera. Finally, the 28 hour timelapse link will play for you the past day as a 5 minute movie at 6 minutes per second. Is anyone else a CoCoRaHS contributor? My station ID is FL-SJ-16. Good site to see members rain totals for the past day along with alot of other information. Here are some reports from the Tampa area from yesterday. I am on a roll this morning! For those who may have some spare time, this is a great site to learn - and it's all FREE. I received my storm spotter certification here. It was a couple of one hour courses followed by an exam. StAugustineFL wrote: Good morning. Feels very summer-like this morning. Warm with high dewpoints. 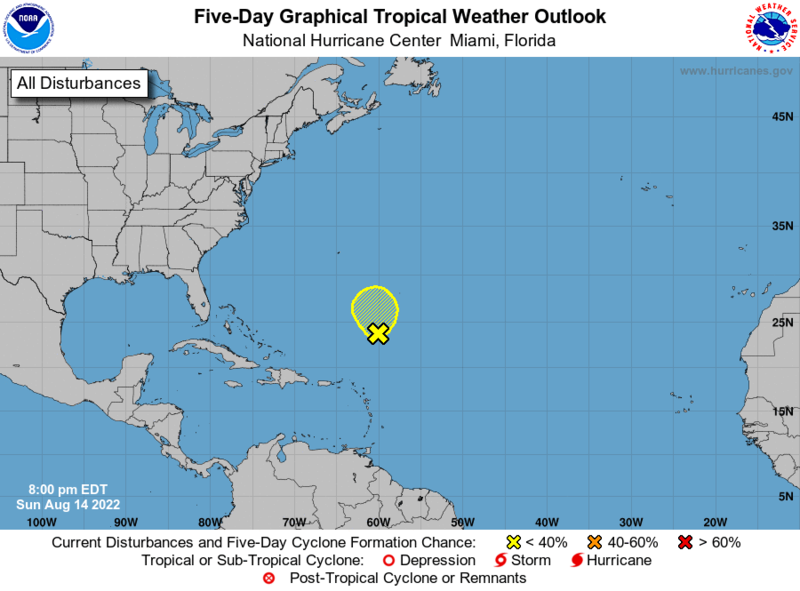 Looks like one more day of dry weather for my area followed by good rain chances tomorrow through mid-week before a front moves through and dries things out. yeah for sure..we really need this badly. .18" here in the gauge from yesterday evening's rain. That was our best shot for the next few days, but the E/SE flow will give us a slight chance with late day sea breeze convection. For the most part, my 360 degree shield around my small area worked to keep the best rain north and south of me! highs are closer to normal in the upper 80s to lower 90s. will help to push the next cool front through the southeast U.S.
Wednesday and across the Florida peninsula Thursday into Friday. the boundary will become nearly stationary across south Florida. normal with highs mostly in the middle to upper 80s. I'll be darned. A very small shower is moving through. I'll see a tenth of an inch at best but it feels good to see rain. I wasn't expecting any until tomorrow. sangria wrote: Good Morning everyone! I hate when that happens! .69" just to your south north of the Pinellas line per the CoCoRaHS map I posted a few posts back. corridor during the afternoon when the seabreezes collide. That morning update sounds promising Largo. Hopefully, we'll get another shot this evening. whew its sure HUMID here..just finished picking up the tree pieces that blew off the tree's last night in those thunder storms and mowed my lawn etc..wow soaking wet everything is..including me lol..but now everything looks good and I can rest.....nice to see the ground wet again around here..hope it continues. I am pleasantly surprised. The earlier shower dropped .07" in my gauge. A much stronger shower popped up behind it and dumped .49". Total of .56". Sun is out now and the rain should transition towards the interior and west coast. sangria wrote: That morning update sounds promising Largo. Hopefully, we'll get another shot this evening. yes its almost 4pm and as I walked my dogs I noticed the west coast sea breeze has pushed over my area..NWS says the storms will fire up when the 2 sea breezes hit into each other,might just be another good evening rainwise here San...good luck up there ok.
StAugustineFL wrote: I am pleasantly surprised. The earlier shower dropped .07" in my gauge. A much stronger shower popped up behind it and dumped .49". Total of .56". Sun is out now and the rain should transition towards the interior and west coast. wonderful, glad you got some good rain there Aug..sun is still out by me so far. I wish Matt and Scott and the other's would show up here and join in with us. maybe they will come when the tropical season kicks in. occasional lightning, heavy downpours, and winds to around 30 mph. Not much happening on radar or any real indicators on visible... this might be a dry evening. 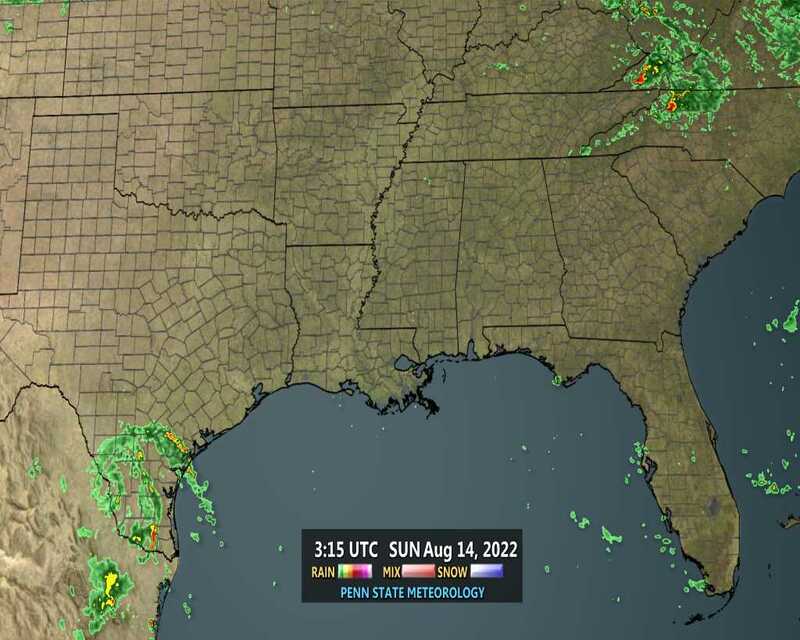 hot sunny and Humid here just after 5 30pm sat and no rain in sight..but I think I remember NWS saying rain in the evening hours...maybe after dark huh. near Ozark, moving north at 30 mph. sangria wrote: Not much happening on radar or any real indicators on visible... this might be a dry evening. Panama City, moving east at 20 mph. Head, Overstreet, Bennett, Brannonville and Millville. Moderate risk of rip currents at east coast beaches. minor flooding problems at times. Jacksonville website on the internet at weather.gov/jax. Good Sunday Morning folks! !...well looks like today the fun starts weather wise..heed your local warnings if any and stay alert ok...hopefully tampa bay area will get some good rain again...was dry yesterday here by me....well Blogs Coffee is perking for when you get here..enjoy..have a wonderful day everyone!! I thought I might get lucky, but the shield did its job again! Some areas the north side of Tampa got as much as 3" with a nice late evening cell. This was the earlier one. Thunderstorms are expected this afternoon and evening. create a dangerous situation in which heat illnesses are likely. Yep Largo, could see some stronger storms here the next 4 days. NWS JAX mentioned the possibility of a flood watch at some point. Rather impressive considering how dry it's been. Hopefully my area can squeeze out a good 3" between now and mid-week. It dries out for several days beginning Thursday but especially Friday into next holiday weekend. Shaping up to be a perfect Memorial Day up this way.